GeometricMagic adds the functionality of Geometric Magic, like that shown in Fullmetal Alchemist and more. Through redstone designs on the ground, one can do wondrous things such as teleport, transmute blocks, and build grand sculptures with little to no effort. There are permissions now! Check them out http://dev.bukkit.org/server-mods/geometric-magic/pages/permissions/[here! This plugin is meant to remain commandless, utilizing just the redstone drawings. Click to find out how to utilize the current circles! Check the known bugs section above first, and then post your bug in the bug reports subforum of the forum. There's a forum for that too, so try to keep it out of the main page comments. cakenggt has decided to stop updating this plugin. Because it's free and open source software, I've decided to continue it on my own page. any way a config could be added to block the creations of P stones? @BrandonAest Its right here http://dev.bukkit.org/server-mods/geometric-magic/pages/permissions/ he didn't format the link correctly. Umm webpage for the permissions does not exist? Are you saying lightning strikes don't work when a circle is learned? Or what doesn't work exactly? What circle is it you are trying to make? Ok, I am having a problem the lightning strikes and everything when its incorrect for transmutions and attacks and stuff, then when they are proper and learnt or correct, it does not work. Anyone help me please? :) thanks. This plugin is brilliant! Though, it desperately needs work, especially updating. If the creator has abandoned this project, I'd love to see someone else take it up, whilst keeping the Fullmetal Alchemist theme. I see. In that case, I suppose I'll probably be starting my own page soon. I'm not quite sure when, probably within the week. Not sure if he changed his mind but this is what he has told me, "I'm sorry to tell you this, but I feel like I have gotten to a place with geometricMagic where I'm not really super interested in developing it anymore. since it is open source, anyone else could take over the project if they wanted to." When did he officially say that? I was waiting for him to reply to me before I did anything "extreme". I know that I could have continued it on my own, seeing as it's licensed under the GNU GPL v3, but I wanted his permission to continue it on this page instead. Also, I just want to say that I've been very busy recently, and therefore couldn't do much development on this plugin at all. However, I should have some free time coming up, and I'll get back to it. I think Cake is okay if you take the source of plugin and continue it on your own page, he has discontinued making this plugin. Yes, it sounds like it could be a conflict with that plugin, because the items are always visible to me. Also, I think I'll be doing some development today and implement the features I was planning to, just a heads up. EDIT: Unfortunately, the development that I had planned today did not happen due to a few unexpected events. In this case, I'll be doing development tomorrow instead. Ah thank you, that makes sense. Except the items are not visible to me but I can still pick them up if I go to the spot I died. Possibly that could be a conflict with the Keep Items plugin I have installed so people keep their items and xp when they die. That's interesting to know. I actually had a similar issue, but I didn't think that it was because of GeometricMagic. I'll look into this. Thanks for the report. Also, don't think that I've abandoned development, I'm simply taking a break. If this issue is caused by GeometricMagic, then it needs immediate attention, and I will fix it ASAP. EDIT: I've looked at the code, and it appears this was done on purpose. If a player dies with a lot of XP, then instead of dropping it all as XP, it will drop it as items, such as diamond blocks. I'll make a config option to enable/disable this when I get the chance. I was testing some things out. It seems when people died, in particular in my testing my level was really high like 17000 and I used /kill and came back to the spot I died there were some hidden items there. Such as diamondblocks, jukeboxes, pressure plates, and stickypistons. I had nothing but a diamond in my inv which was in my hand at the time. I traced it back to this plugin causing the problem because it doesn't happen if I disable this plugin. A maximum transmutation size limit is definitely planned. I've had this issue as well. Especially since this now triggers block breaks/places, it will lag a lot with large transmutations. I'll do this when I finally get back to coding this plugin. I tested the permissions before and it seemed to work for me now so thanks =) I will have to test again to see if it fixes the other problem I was having with the circle.set affecting all circles, not just the set circles. Is there some way to limit the size of the transmute circles yet? 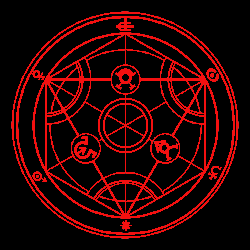 For example maybe it could use a similar permission system to the set circles for different sizes to prevent someone from making a transmutation circle that can go too big. I know it limits it by the XP but if someone collects a bunch of XP somehow and then makes a massive transmutation it could lag things or potentially cause much grief. But if the size is limited then maybe it will have less of an impact. I really hope that cakenggt hasn't abandoned this plugin, but until it's updated for 1.2, if you're having issues, you could try my custom build (posted below). Is the developer planning on making a 1.2. * release? i will be sleeplessly waiting.